See INSTRUCTIONS Below and many more Basketball Necklaces. Easy TEXT BOX TEMPLATES make it simple to Type in the basketball player’s NAME and or their favorite JERSEY NUMBER in the TEXT BOX(ES). Personalized Basketball Necklaces with NAME and NUMBER. I was so excited last Christmas to see that this Silver Finish Basketball Necklace was the top selling of all necklaces on Zazzle last Christmas season out of over 1 MILLION Necklaces. Thank you for helping me achieve such an honor. I even took a screen shot it was so exciting. Available in several different styles and finishes. Round and Square in Small to Large sizes. Locket styles and Finishes including Sterling Silver Lockets for Girls and Ladies, Silver Plated and Gold Finish. I can make changes to my designs if you like. This is a great Basketball Team Gift Ideas. Great Basketball Christmas Gift. 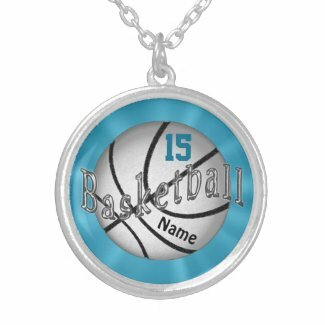 Pretty satin like Turquoise background, cool glassy look “Basketball” word scrolled across the Silver Basketball Necklaces with her Name and Numbers typed into the template text boxes. 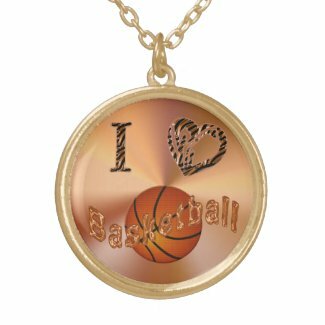 SCROLL DOWN for more Personalized Basketball Jewelry for Girls and Women. 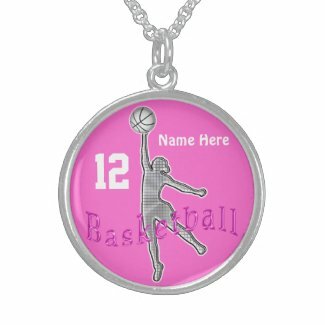 Customizable and Personalized Basketball Jewelry for Women and Girls are great Basketball Gifts for Players and Birthday gifts to celebrate their love for Basketball. Make it extra special this Christmas with this Basketball Jewelry. She will love showing off her Jersey Number. Truly awesome Gift for Basketball Players and Fans. More Personalized Basketball Necklaces Below. Basketball Christmas Gift Ideas. Personalized Basketball Gifts. 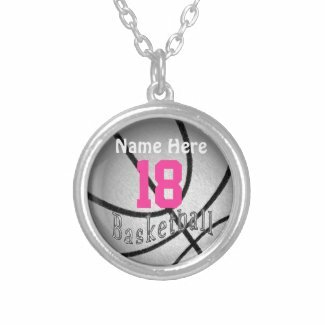 This is my most popular Original Design Basketball Necklace with her Name and Number. Once you are at the product page, go to your right under the “Edit this design template” and for more than one template, Click “More” to see all text box templates. Highlight the temporary Text and Type in Hers or his Favorite Basketball Jersey NUMBER and Her NAME or short phrase. If you don’t want any Text on the Basketball Number Necklace, than just Highlight and DELETE the Text. It is so easy to give Affordable Personalized Basketball Jewelry. by Typing “NAME and NUMBER” in the 2 TEXT BOXES on the Basketball Necklace product page. See Image Below for a Visual Instruction and # 1 -8 for a Step by Step Instruction. Cool Gifts for Basketball Players, they make great Christmas Gifts. You can also change the Color of the Name and Number. CLICK the Blue “Customize it” Button. Click on the Name or Number Layer to Select it. Under the “Customize it” area, you will see a tiny little Color Box. Click the COLOR BOX, and choose your Color and Click “Done”. If you have a specific Color CODE, Click on the “Advanced” blue word underneath ALL those tiny Color Choice Boxes and Enter your Color Code into the Color Code Box and Click “Done”. Don’t hesitate to call Linda for HELP or even Changes to ANY of my designs to help you make it her very own Personalized Basketball Jewelry. Click “More” on your right, to see ALL text box templates, located below the “Edit this design template” to the right of each Basketball Necklace. Then Type in her NAME and her favorite Jersey NUMBER (or MONOGRAM) into the TEXT BOX(ES) Select the Basketball Locket or Necklace Style, Size and Finish. She will cherish this special memory forever. NOTE: For Basketball Team Gifts, Personalize ONE necklace at a time, ADD to CART then Go Back with your browser Internet Arrow to customize the next basketball jewelry. 2. On your right of each basketball necklace, Under “Edit this design template” Box, Click “More” if there is more than one template for text or image. 4. Choose the STYLE: Locket, Square or Round Basketball Pendant. 5. Choose the Finish: Silver Plate, Sterling Silver and Gold Finish. The price for each finish, style and size will show in the upper right of the website. 7. Select your quantity if it is more than One Basketball Necklaces or Basketball Locket. Thank you for visiting my Personalized Basketball Jewelry for Girls and Women, I really do appreciate it. Feel free to call Little Linda Pinda Designs for any requests, HELP or questions. Choose Silver Plate, Gold Finish and Sterling Silver Basketball Necklace. Select the shape and the size too. Select from Basketball Lockets in the various finishes: Silver or Gold finishes and Sterling Silver. Many Basketball Necklaces with Numbers by Little Linda Pinda Designs. Great for Christmas, End of Season Gifts for Basketball Players and Basketball Birthday gifts. In March of 1982, Patty Coyle was named the Most Valuable Player in the Tournament Championship with a winning victory of 83 to 77 with Patty contributing 30 of those points. That’s more than 1/3 the total score achieved by just one player. Terry Dorner contributed another 25 points putting Rutgers as a AIAW National Championship over Texas. June Olkowski was honored in March 1982 because she averaged nearly 20 points and ten rebounds. She became the 2nd Rutger’s women’s basketball player to receive the KODAK ALL AMERICAN name. She later had her Basketball Jersey nmber retired making her the only woman with that honor. Rutger’s Freshman, Sue Wick contributed twenty three points to Rutger’s Two Hundredth win over Missouri (66 to 63). She was in the Big Eight at the time. For HELP or SPECIAL REQUESTS or Changes to ANY of my Designs or to have ANY Design Placed on a Different Product, Text or Call Linda at: 239-949-9090. Calling and Texting are the best methods of contacting Linda because I get so many emails. I don’t want to miss you. These are such great Gifts for Basketball Players and they make great Birthday Gifts for that special person. Everyone loves the Basketball Jewelry for Girls with their Number and/or Name on them. Change the Basketball NUMBER on ALL of my Personalized Basketball Gifts for Players, Fans, Coaches and those that LOVE the game. If you need help, give me, “Linda”, a call if you would like me to create a special design for you at no extra cost and you get to view the product online before you decide if you wish to purchase the Custom Basketball Gifts. I love creating these fun Basketball Necklaces. Basketball Necklaces with Numbers are very popular gifts for basketball players. Thank you again for shopping with Little Linda Pinda Designs. Cool Personalized Basketball Jewelry for Girls and Women is an original creation by Little Linda Pinda Designs. I can easily make changes to ANY of my designs or I can put ANY design on ANY of my Zazzle products. If you prefer different colors, that is something that can be done with no problem and no extra charges. You get to view it prior to deciding if you wish to buy the Personalized Basketball Jewelry. Basketball Jewelry for Women and Girls will be a lifetime memory. Personalized Basketball Gifts for Teenagers and Women. Everyone loves seeing their NUMBER and or NAME on Personalization Gifts. Thank you for stopping by our Basketball Jewelry for Girls and Women. I am happy to create a special gift for you with your school colors or any changes to any of my designs. I put these designs on any of the Zazzle gifts too. If your whole team is looking for a very special gift for your very Special Coach, you might all want to get together and buy her a Sterling Silver Jewelry Gift. That would be extra special to anyone.